Originally published as a satirical cartoon in The New Yorker by American cartoonist Charles Addams, The Addams Family have delighted audiences since their debut way back in 1938 with their affinity for the macabre. Known for his dark humour, Addams’ cartoons originally featured a collection of unrelated characters, connected through his love for standalone dark humoured gags. 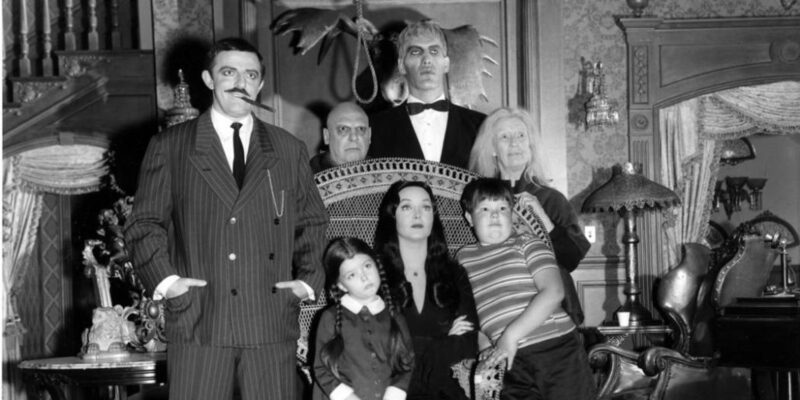 However, over time, Addams gradually added more recurring characters to his comics which eventually shaped the loveable dysfunctional family that we know as ‘The Addams Family’ – Gomez, Morticia, Wednesday, Pugsley, Uncle Fester, Lurch, Grandmama and the Thing. His humorous take on the inversion of the ideal nuclear American family was such a hit that it wasn’t long before Addams was approached by the tv network giant ABC, who commissioned a two season television series from 1964 – 1966. Interestingly, the show’s main rival during its original airdate was The Munsters – a similarly themed, dark humour sitcom that was a big hit with families across the world. Whilst The Addams Family tv show was not an instant hit during its original airing, it soon gathered a cult following and is often quoted as having a profound influence on American culture, including inspiring the goth subculture. Whilst most people think that filming the show in black and white was an intentional stylistic choice, it was actually just a product of its era, with the show being one of the last network series to be filmed entirely in monochrome. In retrospect, the monochrome palette of the show is a particularly happy accident of fate which added to its spooky and supernatural quality. After a run of animated series during the 70s, and the growing cult status of the 1964 tv series, Paramount bought the rights from Orion (who almost went into bankruptcy over the production of the film) and sought to immortalise The Addams Family on the silver screen. Originally Tim Burton was sought out to direct the film – a perfect choice, with his known love for the weird and creepy – but the role was eventually taken on by first time director Barry Sonnenfeld (a cinematographer known for his work with the Coen brothers). During the film’s original release in 1991, it faced fierce competition from Hook (Spielberg’s grown-up Peter Pan fantasy film), but everyone’s favourite ghoulish family managed to surpass exceptions and the movie became an instant classic. 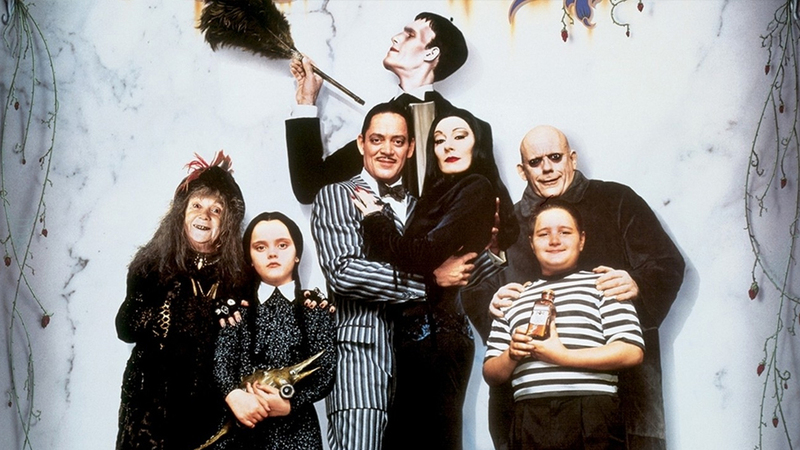 The success of the film spawned a sequel two years later (Addams’ Family Values, 1993), which was yet another commercial success, demonstrating the continuing popularity of The Addams Family brand. 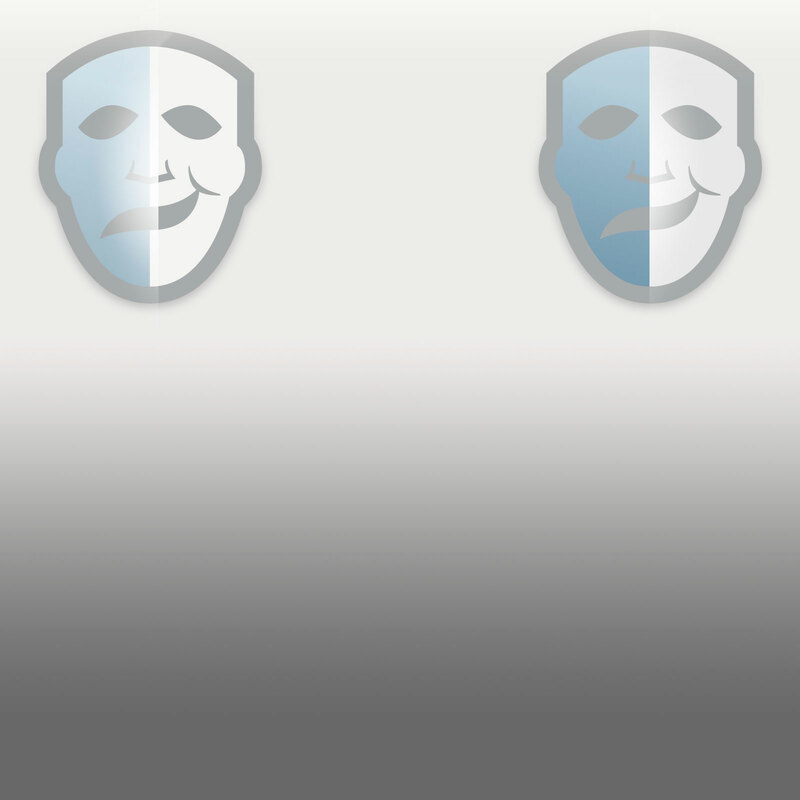 Although the look of both the original tv show and the film stay very true to the original source material, it is Ruth Myers’ depiction of the fiendish family in the 1991 film that has stayed the test of time. Nominated for her costume work in films like L.A. Confidential (1997) and Emma (1996), Myers simple but iconic costume designs seemed to capture the true essence of the mysterious Addams Family. Building upon the styling of the original designs, Myers sought to create a timeless look that would not only hark back to Addams’ original artwork, but also keep the gothic flavour of the original 60s tv show. Uusurprisingly, Myers earned an Oscar nomination for Best Costume Design for The Addams Family (1991). To this day, The Addams Family remain one of the most popular dress ups for Halloween and have, for some, become the personification of the spooky holiday itself. In fact, you might say that their legacy makes them (real or not) one of America’s most enduring and influential American nuclear families! 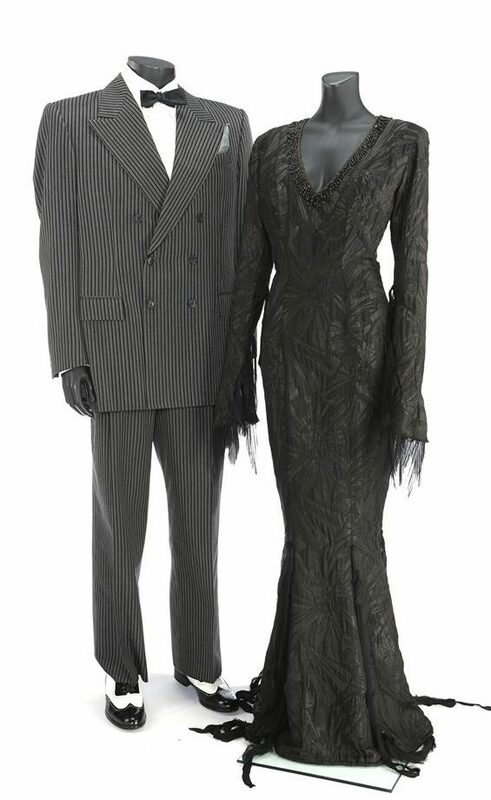 In this year’s Entertainment Memorabilia Live Auction, we are lucky enough to have a number of the amazing iconic signature character costume lots from The Addams Family (1991) and Addam’s Family Values (1993) films – including Morticia, Gomez, Uncle Fester, Lurch, Pugsley and fan favourite Wednesday. Morticia’s trademark gothic brocade gown is a definite showstopper. Seen in numerous scenes throughout the first and second films, the gown features an elegant V-neck with decorative beading. The sleeves and train also include intentionally distressed strips of material that drape freely to give a supernatural, floaty movement to the dress that help give Morticia her trademark other-worldly look. Gomez’s bespoke black-and-grey double-breasted pinstripe suit, with its enlarged shoulders, pays homage to the almost comical proportions of Gomez’s original character design. It also makes a whimsical play on Gomez’s apathetic attitude to work versus the traditional ‘role’ of the pinstripe suit – the pinnacle of corporate business attire. The lot includes a dress jacket with matching trousers, a dress shirt, a bow-tie, a pair of wingtip dress shoes, a pair of elegant house slippers, two pairs of socks and two handkerchiefs. Both the jacket and the trousers feature a Barbara Matera label stitched inside that reads “Mr. Julia”, and written at the neck of the white dress shirt is “RJ”. Uncle Fester’s bespoke longcoat is made of soft drapery fabric, and features a muted floral pattern throughout. Interestingly, his outfit (and many of the other Addams Family lots) employs the use of a pattern against a muted costume palette to give the character more dimension in the dark skulking corners of the Addams Family mansion. His iconic frumpy coat easily reflects Festers weird and scruffy nature. Lurch, the Addams’ sombre butler, has a tall and broad frame that is reminiscent of Boris Karloff’s iconic characterisation of Frankenstein’s monster. His formal and traditional manservant uniform echoes a previous era. Alongside the family’s timeless styling, it adds an air of mystery to the family’s origins and plays upon the idea that the household might indeed be bygones from the past, and maybe a little supernaturally inclined! 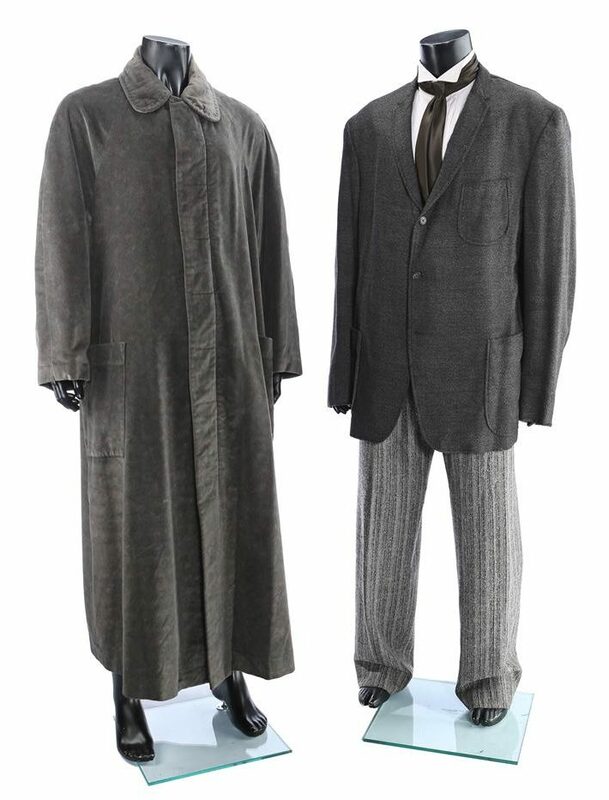 Lurch’s suit includes his trademark heathered coat, made by High Society, which includes a wardrobe label inside the lapel pocket that reads “Carel Struycken” – the name of the Lurch’s actor. Stitched to the inseam of the trousers is another wardrobe label which reads “Lurch” and “10/15/90”. Wednesday Addams’ (Christina Ricci) trademark look is a must-have for any Halloween dress-up party. Her sadistic tendencies and dark personality lend itself to her costume’s satirical take on a clerical high-collared gown. And whilst hideously depressive and macabre, Wednesday is definitely an enduring fan favourite, from the original comics to now, with her quick wit and amazingly quotable lines. Pugsley’s costume, with its traditional striped black and white top, is a humorous take on a prison uniform that mirrors his wickedly deviant and trouble-loving nature. From gleefully lopping off the heads of Wednesday’s dolls, to inventing and constructing death machines, Pugsley is a typical (if eccentrically inclined) mischievous little boy. 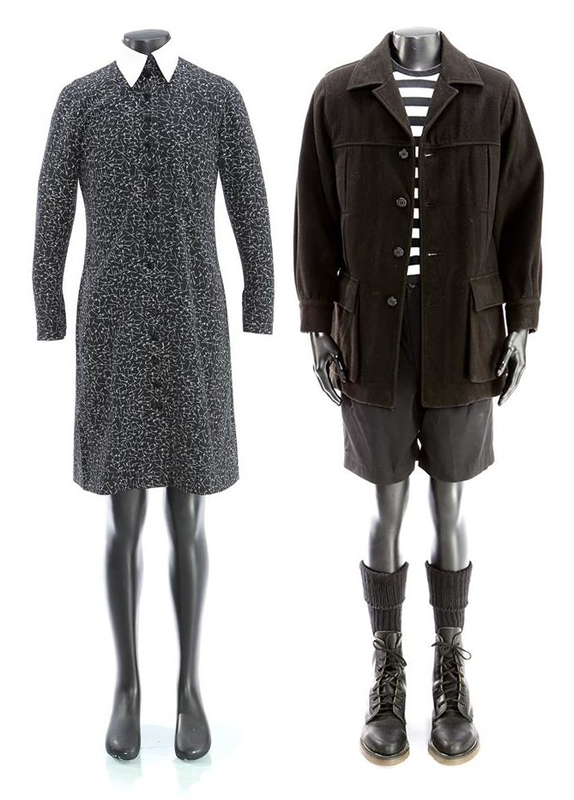 The costume lot comprises a coat, a shirt, a pair of shorts and a set of socks and boots. Also included are Pugsley’s black cotton socks and leather boots, along with a wardrobe tag noting the character, actor and change number.